Tavern Promotions is the only company in Southern Africa offering a unique range of English style portable Pubs to the South African market. All the pubs are manufactured in the UK, and meet with the stringent United Kingdom and South African fire and safety standards. With 4 very different Pubs available, Tavern Promotions can supply a Pub to suit any size function. 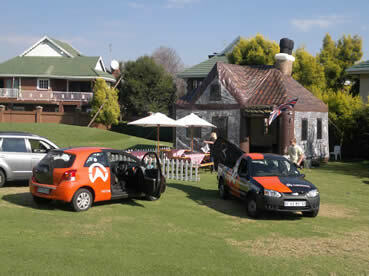 The Kilderkin Pub at Benoni Country Club Golf Course. DOWNLOAD OUR EASY REFERENCE "PUB GUIDE"